India Aryan Civilization - HISTORY'S HISTORIESYou are history. We are the future. 5. ﻿﻿Conflict & Cooperation:﻿﻿ How has warfare shaped human history? The Red Dot on Foreheads: Have you ever wondered why Indian women place a red dot on their foreheads, between their eyes? The "tilak" or "bindi," as the red dots are called, are an ancient Indian tradition that goes back to Aryan times. In ancient times, a groom used to apply a spot of his blood on his bride’s forehead in recognition of wedlock! At one time, the tilak, or bindi was a sign of a happily married woman. A single woman, or one who was a widow, did not wear the mark. While it remains a very old tradition and a sign of marriage, today it is much more of a fashion accessory. 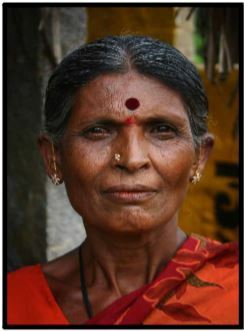 Today, the bindi can be any color, any shape or size, and women often wear more than one. The transformation in the use of the bindi is evidence that even old traditions can change over time. Things certainly changed in the Indus Valley when a new group called the Aryans arrived. Review: What is a nomad? Who Were the Aryans? In Sanskrit, an ancient Indo-European language, the word Aryan refers to "the noble ones." The Aryans migrated from their ancestral home near the Caucusus mountains, north of the Black Sea in Central Asia (near modern day Russia). They entered the Indus Valley through the fabled Khyber Pass. The Khyber Pass cuts through the Hindu Kush Mountains in Pakistan, India's neighbor to the northwest. In contrast to the city-dwelling Harappans, the Aryans were nomads who raised livestock, rode chariots, and loved to gamble. They lived in simple homes. They grouped in clans, and herded sheep and goats. They were ruled by warrior chiefs called rajas. The Aryans fought with long bows and arrows and bronze axes. They rode into battle on chariots. Their history is one of constant war among themselves, between their various clans. Did Aryan warriors in chariots conquer the walled cities and force the Harappans to flee? Until recently, that's the story that History books told. New research, however, suggests that when the Aryans arrived in the Indus Valley, Harappan cities had already laid in ruin for over 200 years. Archaeologists are just now beginning to discover evidence that can tell us about the Aryan migration. Until science offers us more insight to the lives of the Aryans before they entered the Indus Valley, we have something else we can use to learn about them. The Aryans created marvelous stories, stories they told or sang for centuries. Left, the Khyber Pass forms the bridge between Central and South Asia. It has long been one of the most important trade routes and strategic military locations in the world. Alexander the Great marched his army through the Pass in an unsuccessful attempt to capture India in 326 BC. Around a thousand years earlier, the Aryans migrated through the Pass to settle in India. Later, it became a primary conduit for Silk Road trade. The Vedas: Aryan beliefs, rituals, and daily life are described in the four Vedas. The Vedas, written in Sanskrit, are a collection of poems and sacred hymns, composed in about 1500 BCE. Veda means knowledge. Hinduism is a religion with ancient roots. It developed as Aryan and native Indian beliefs merged. Today, Hinduism is India's dominant religion and is still practiced by over 80% of the population. The basics tenets of Hinduism can be found in the Vedas. Notice that you can see the word "Indus" contained within "Hinduism." CLICK on the pocket-sized edition of the Vedas above to hear the Rig Veda chanted. Svetaketu always came proudly home from school each day. One day his father asked him about God but Svetaketu didn’t know anything. His father sent for a glass of water and asked Svetaketu to put some salt in it. The next day he asked where the salt was. Svetaketu could not see the salt but he could taste it in the water in the glass. "That’s a bit like God in the world," said his father. "God is invisible, but is there in everything." The Vedas are composed of the Rig, Sama, Yajur, and Atharva Vedas. That is why the period from roughly 1500 BCE to 1000 BCE is called the Vedic Period. It is named after the Vedas. The Ramayana & the Mahabharata: Around 1000 BCE, the Aryans started to create two marvelous epics. We know about daily life during this period from these famous epics, the Ramayana and the Mahabharata. These epics are stories about Aryan life, wars, and accomplishments. School kids in India today know these stories well. They’re great stories! The Ramayana tells a story in which the (good) Aryan king Rama destroys the (evil) pre-Aryan king Ravana. To the right is an illustraton of Rama battling Ravana's demons. The other epic, the Mahabharata, tells of Aryan wars where two clans battle it out, and one emerges victorious. The battles waged in the Epics symbolize the victory of good over evil and, like myths, taught the Aryans about such things as honor, courage, and proper behavior. This is why the period from roughly 1000 BCE to 500 BCE is called the Epics Period. It is named after these two great epics, the Ramayana and the Mahabharata. How did the Aryans live? The Aryan clans or tribes, a collection of people, settled in different regions of northwestern India. The chief of each tribe was a hereditary job. If your father was a chief, someday, you would be chief. It was the only way to become a chief. The chief made decisions after listening to a committee, or perhaps even to the entire tribe. People had a voice, but the chief was the boss. Aryan Houses: The people in the Vedic period lived in straw and wooden huts. Some homes were made of wood, but not until later, during the Epics Period. Social Activities: What did they do when they were not working or fighting each other? The Aryans loved to gamble. As nomads, they were excellent horsemen. They introduced the horse to ancient India and enjoyed racing chariots. They played fighting games. They loved to tell stories. The ancient Aryans were proud and fierce, and deeply religious. They were polytheistic, which means that they had many gods and goddesses. In the beginning, these were just occupations. As Indian society became more complex, however, these classes developed into what was later known as the caste system. A caste is a social class whose members are identified by their job. Early on, you could move from group to group. That changed over time, however, until a person’s occupation or group depended upon birth. If your father was a farmer, you had to be farmer. Moving from one group to another became very difficult. This was the beginning of the caste system. Over time, the caste system added one more group - the Untouchables. The Untouchables exist at the bottom of the social ladder. In time, social norms dictated that people could not even talk to someone outside their group. The entire caste system can be summarized in an old Hindu proverb that states, "It is better to do your own job poorly than to do someone else’s job well." Education: Kids were taught by a guru (a teacher). Even sons of the chief had to obey the guru. All students followed a rigorous course of studies, which were imparted orally. Writing was done on bark and leaves, and hence was perishable. As a result, we have very few artifacts to tell us what they studied or what they wrote. Yagna: The life of the tribal Aryans was focused around the central fireplace called the Yagna. Dinnertime was social time. The tribe would gather around the central fireplace, and share news, and the day’s happenings. Those who tended the central fireplace also cooked for the rest of the tribe. This was a very special job. The fire tenders were the middle-man between the fire god and the people. These fire tenders, later on, formed the caste of priests. The Aryans ate meat, vegetables, fruit, bread, milk, and fish. The word for guest was Go-Ghna or eater of beef. CLICK to view the celebration of Holi. Holi: Holi, the festival of color, is a very old festival and probably dates from Aryan times. The festival of Holi is still celebrated in India today as part religious festival and part social gathering. The festival marks the end of Winter and the beginning of Spring and symbolizes the triumph of good over evil. 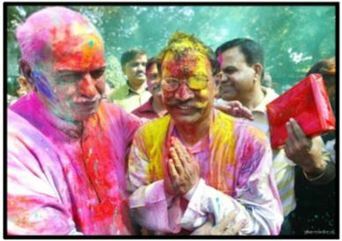 Holi is celebrated over two days. The festival's first evening includes a large, public bonfire that represents the purification of the spirit. Today, weeks before the arrival of Holi, gangs comb the neighborhood and collect all the waste-wood and old wooden furniture they can lay their hands on. After weeks of preparation, judiciously combined with activities that come close to pillaging, assorted pieces of wood are piled up to be lit on the evening of the festival day. On the second day people throw colored powder and water at each other.